Buy 2 doses of Bravecto for Dogs and receive a $15 mail in rebate; buy 4 doses and get a $35 mail in rebate. Purchase Simparica and sign up for the Zoetis Petcare Rewards program. Earn up to $35 back to be used towards any purchase in our clinic. Ask our receptionist or your veterinarian how you may receive this offer. Receive a 20% discount on the second box for this product when you purchase a 12 month supply. Ask our receptionist or your veterinarian how you may receive this offer. 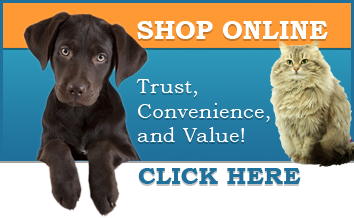 Buy Vectra 3D protection for your pet and receive free product from the company delivered to your home. Receive a voucher for 1 free tube for 3 tubes purchased or 3 free tubes for 6 tubes purchased. Vouchers are available at our front desk. You are responsible for redeeming the voucher for free product by scanning QR code with your smart phone, visiting their website, or by mailing in the completed form on the back of the voucher. Ask about the Zoetis Petcare Rewards Program. By registering for the Rewards Program you may receive up to $60 through this program to use towards purchases at our clinic. This program also includes rewards for purchase of ProHeart 6, Revolution, Simparica and Convenia.